These rock 'n' roll oldies were recorded during The Beatles' Get Back sessions in January 1969, at Apple Studios in London. 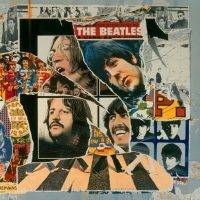 The Beatles recorded a great many cover versions during the Get Back sessions. It is likely that these were partly to motivate the group at a time when their enthusiasm was often lacking, and also as an avoidance strategy when inspiration was needed. Although released as a medley on Anthology 3, Rip It Up/Shake, Rattle And Roll/Blue Suede Shoes weren't actually recorded as one. The songs were among a number of rock 'n' roll songs played by The Beatles on 26 January; others performed, with varying degrees of success, were Great Balls Of Fire, High School Confidential, Twist And Shout, Kansas City, Miss Ann, Lawdy Miss Clawdy, You Really Got A Hold On Me and Tracks Of My Tears. Lennon and McCartney shared vocals on Little Richard's Rip It Up, which segued into Shake, Rattle And Roll – a song first recorded in 1954 by Big Joe Turner, but popularised later that year by Bill Haley and his Comets. Later that day The Beatles recorded Carl Perkins' 1955 hit Blue Suede Shoes, again with Lennon and McCartney on vocals. Their arrangement was closer to Perkins' original, rather than Elvis Presley's better-known cover version from the following year. Ah go, hit it, Carl! I friggin love this! I’m a huge blues fan and all this 12-bar goodness is just incredible. The Beatles were incredibly versatile. And I love me some fifth Beatle, Billy Preston! I just have to thank you Joe for everything you’ve done on this magnificent site. Thank you. The original version of “Shake, Rattle And Roll”, credited to Joe Turner And His Blues Kings (Atlantic 1026), was a number one hit in The Billboard’s R&B chart for three consecutive weeks in June 1954. So it was already a very popular record when Haley released his version in July of that same year. Congratulations for this very entertaining and informative site!